There are a bunch of Wikipedia apps out there for the iPhone and iPod touch right now, all trying to serve different customers. Want an offline version for your iPod Touch? How about a simple, feature-free app from the makers of Wikipedia? Maybe you’re just in the mood to read some interesting articles, handpicked for your reading pleasure. For those of you who (like me) are undecided, Sophiestication (maker of Groceries and Tipulator) has decided to offer one more option in the WikiWar: its new application, Articles. The program, which launched on Tuesday, aims to provide a complete, friendly Wikipedia browsing experience. Users can search by title or content (in multiple languages), and even use the app’s Nearby feature to display articles about places and items around their current location. The articles themselves are presented in a simple black serif font (size is variable and can be changed via pinch-to-zoom), while a pull-down screen orientation lock offers an easy reading experience in any position. The traditional Wikipedia “info” pane has been relegated to a sub-page behind the article’s main image—tap on the picture, and it flips around to reveal a streamlined table of information. For articles with multiple section headers, double-tapping and holding will allow you to skim from section to section until you find what you’re looking for. Article pictures, meanwhile, can be enlarged by tapping, where you’ll then have the option to copy them or save them to your camera roll. And for those who enjoy wikihopping, you might be pleased to learn that Articles supports multiple pages and bookmarking, just like Safari. Recently viewed articles can also be saved to the program for offline viewing. Sophiestication is also running a small promotion alongside the program’s release—if it sells 10,000 copies “within the next few days,” the company will release its new “On This Day” app for free. 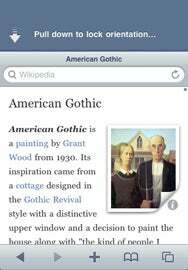 Articles is available on the iTunes Store for $3 and is compatible with the iPhone or iPod Touch; it requires OS 3.0 or later.